As keepers of 'the Lighthouse' we are offering to share this piece of paradise with you. The three level Mediterranean style complex provides extraordinary views, decor and facilities repeatedly referred to as ‘Paradise’. 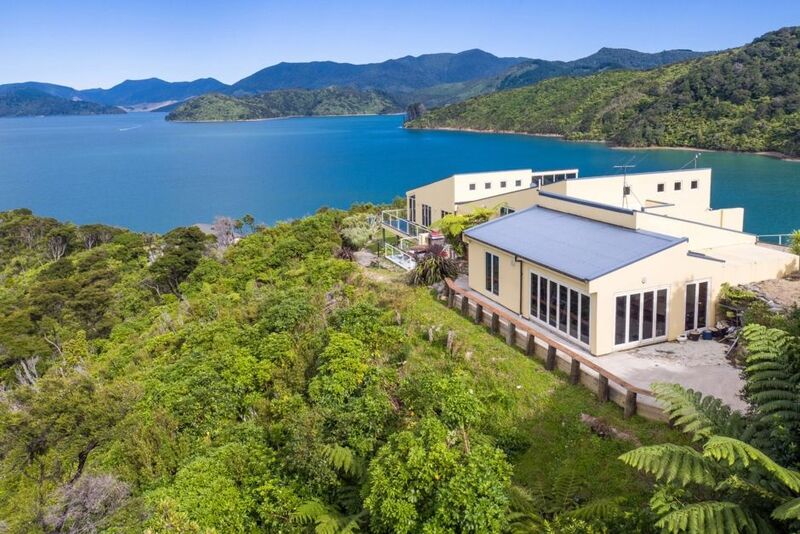 This self-catering, spectacular Portage Bay property offers vast 270 degree elevated views of the Kenepuru Sound, the Portage and Waitaria Bays. A spacious 130 square meter living area situated on the middle level provides the ultimate platform for relaxation and entertainment. Supported by the upper level providing a master bedroom and a second double room, both with ensuites, add to this the large games room / gymnasium attached to the double garage which include a spa, sauna, weights, rowing machine and massage chair. On the third level down stairs are two double rooms, and one open plan room with a double and super King bed, one with ensuite and two with a shared bathroom facility. Throughout the 'lighthouse' there is a large collection of reading material, board games, CDs, DVDs and a TV in most rooms. The open plan living, kitchen, and dining, together with mobile phone coverage and Wi-Fi , we know will meet the needs of our guests. To the west, the 140 square meter deck with covered pool looks directly into the delightful ‘Take-in bay’. A quiet secluded beach with good walking access. To the east a tiled BBQ area looks straight into the Portage bay marina and hotel complex. With full road access, the Portage bay offers a public boat ramp for launching, a water taxi service from Torea Bay to Picton. Walk or mountain bike the amazing Queen Charlotte Track. Or simply relax with a fishing rod in hand and enjoy the many water activities . It is only a short walk down to the Portage Resort Hotel for dining in the restaurant, or enjoy a coffee or cold beverage at the Cafe Bar. ‘The Lighthouse’ really is relaxation in a complete package. Non smoking inside our property grounds. If you need to smoke, outside only. Please be aware, the biggest danger to all properties in the beautiful Marlborough Sounds is FIRE! No open fires. Linen, towels and tea towels (included). Dogs by arrangement, Outside only. In Kiwi Bach style, you are expected to clean the house before you leave. Extras: Cleaning (Optional, NZ$200.00 per stay) to be arranged prior to stay. We looked around many properties in the Marlborough area and we kept coming back to the Kenepuru to have the second and third view! It has location, isolation, views, peacefulness and relaxation. We think it is well worth the drive, fresh fish, sea water, the views of the landscape are forever changing, and the best of all is the hub of the community, quite inviting really! This property's unique 270 degree views, with open plan living and its many amenities, Spa, Sauna, Gymnasium area, Massage chair, Pool table, Swimming pool, Mountain bike, fishing rods and with a rod in hand make this truly a unique rental. 90m (1min) Walk down the driveway to Take In Bay East or West, you choose, or just relax on the deck and enjoy the view of what excitment is happening below on the beach. 90m (1min) Walk down the driveway to Take In Bay East or West, your choice, or just relax on the deck and enjoy the view of what excitement is happening below on the beach! Special conditions: Non smoking inside our property grounds. If you need to smoke, outside only. Please be aware, the biggest danger to all properties in the beautiful Marlborough Sounds is FIRE! No open fires Linen, towels and tea towels (included). Supermarkets/Groceries/Food purchased (Picton or Blenheim) Dogs by arrangement, Outside only. In Kiwi Bach style, you are expected to clean the house before you leave. Extras: Cleaning (Optional, NZ$150.00 per stay) to be arranged prior stay. Stunning scenery. Wonderful amenities in the home. At first I thought we were limited to access for activities. But Paula had assured me and we soon discovered the nearby water taxis. The scenic beauty in that area was incredible. Our family of 16 came from all corners of NZ and ranged from 18 to 74..... from the minute we arrived until we left 3 days later this home and setting was magic. Paula and Guy were extremely helpful and accommodating from the time of booking through to our actual visit ..even checking all was well throughout. I can't recommend this property highly enough if time out together as a family is what you are looking for. It comes with so many features and facilities there is no reason to leave the house although being so handy to the Queen Charlotte track is another plus. Thank you Paula and Guy for contributing to making our Birthday Weekend so special. Thank you for your very kind words in regards to our home. We feel privileged to own and enjoy such a home but have found it very satisfying to be able to share it with people like yourselves and especially when it is a special occasion in one of our guests life’s. Congratulations on your milestone and best wishes from us both to you and your families in the years ahead. Thank you. Guy and Paula Raleigh. This place is set in the most beautiful part of New Zealand. A huge house with lots of different areas for a large group to escape to for time apart. Be aware the room with two beds in is in an open area downstairs from main living area. Noise travels! The toilet is shared with the other two downstairs bedrooms. The main bedroom was lovely with an amazing bed. The views from nearly every window in the house are incredible. Worth a stay. Thank you for staying with us and your honest feedback which is noted and will be quoted for future bookings. Also we thank you for looking after the property during your stay. Yes it is does have forever changing views! The property is very well appointed. The location is fairly remote and with outstanding views. Absolutely gorgeous home and private which meant a lot to us?? thank you for staying with us and your kind comments, we think its a pretty special place too. Gorgeous property with amazing views! Happy birthday! Great group, thank you for staying with us. Or relax with friends, bring your boat and launch from the Portage or Torea Bay boat ramps, have the choice of both Sounds (Queen Charlotte, Kenepuru to the Pelorus). It really is a beautiful place, you won't want to leave!